There are often times when you need to place a light or other piece of equipment in a location that just does not facilitate a light stand or tradition mounting apparatus. 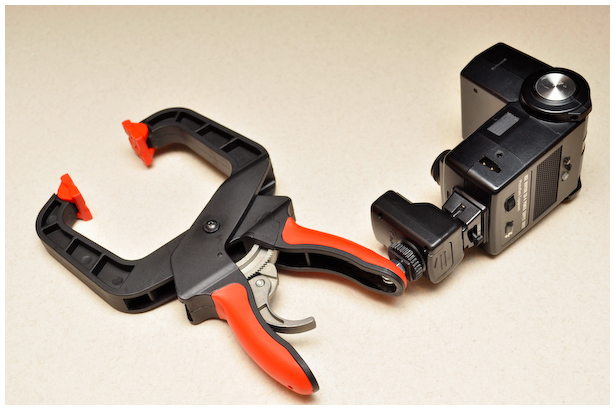 Enter the invention of the ever-so-versatile super clamp. 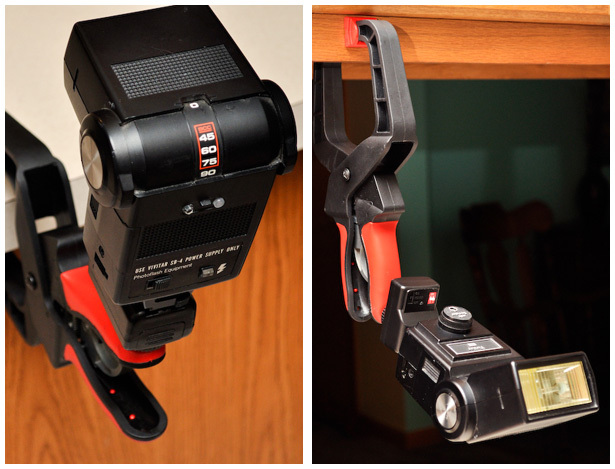 This device allows you to mount anything from lights to cameras in a variety of locations, including poles, doors, and tabletops. I chose the 4″ clamp simply because I wanted the flexibility of being able to clamp it onto larger objects, but a smaller clamp would work fine as long as it can fit over whatever objects you anticipate locking it onto. The process of converting an ordinary clamp into a force for change is rather simple. 1. Drill, cut, or burrow a hole into the end of the handle opposite of the finger release. Be sure to make the just hole large enough for your screw to fit through. 2. Insert your screw into the hole (yeah, my mind went there, too) being sure to keep the head on the inside of the handle. 3. 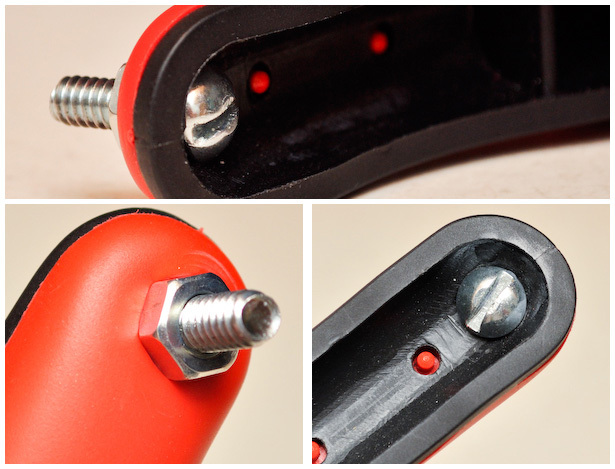 Tighten the nut onto the screw from the outside. 4. Attach a 1/4″-screw enabled device of your choosing, and you’re good to go! 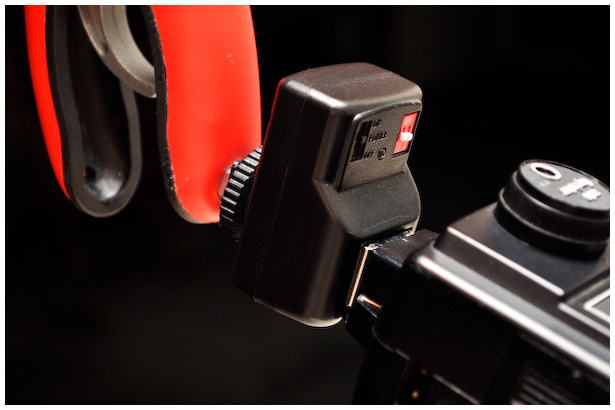 TIP: While I haven’t tried this yet myself, I believe that adding thin, soft rubber pads of some sort to the “grippers” of the clamp will enable it to achieve a better grip and keep it from slipping as easily when heavier equipment is attached. LEFT: I clamped a flash unit to the 4-inch cement ledge of an amphitheater’s step and aimed it at the back (and side) of the couple to create a rim light and introduce another lighting dimension to the photograph. RIGHT: I clamped a flash unit onto a music stand which I had laying on the floor and aimed it at the wall behind the subject to create some separation from the background. Have a DIY hack or how-to you’d like to share? Leave a comment or send it in an email, and it might just get featured in a future post! I’ve just started strobing and dSLRing and can relate to budget restraints. Being a Macgyver, of sorts, I think along the same lines as you – using alternative, yet easily accessible items to make things work. You are a genius of mechanical and creative ingenuity and very much down to earth. Thank you for sharing your knowledge and your creative and beautiful compositions. Can you furnish some information as to what you are using to power the flash. I am a carpenter and have a bunch of these clamps and I will certainly dedicate one of them to this type of use. Thanks for this simple solution. The speedlight is a Yongnuo Yn-468 e-TTL (http://amzn.to/y8fZVc – a great flash for the money!) powered by 4 AA batteries. The trigger is an el cheapo NPT-04 “Cactus” trigger/receiver that can be easily purchased online for little cash (http://amzn.to/AFsO91). Granted, these aren’t PocketWizards, by any stretch, but they do the job on a budget. My one set of triggers is still going strong after a year and a half of pretty regular use. Thanks for the tip! I haven’t really had any “slippage” problems with the bolt/nut so far with the occasional occurrence of the whole lot of it turning a bit in the clamp handle itself. I put together one of these a while back. Because you’re usually limited in how/where you can place them, they’re made a whole lot more versatile if a small ball head is attached to the bolt. It will be a lot more secure if you use a slightly longer screw and add a wingnut to tighten against the light you are using. And yeah, a ballhead is a big plus too.